In Interlagos Pastor Maldonado succeeded in being even less popular than usual it seemed. Much of this of course was a hangover from the Austin goings-on of a week earlier, wherein after qualifying he - at the very least - heavily implied that his Williams team had done the dirty on him. And he wasn't the flavour of the month anyway, given he and his management apparently had spent weeks trying (successfully as it turned out) to extract him from his Williams obligations as well as that the Venezuelan made some not entirely flattering public comments about the team as they did so. I even read someone somewhere in course of last weekend describe him a 'vile'. While in the Brazilian race things didn't improve much as he finished the year in what some might say was familiar style, colliding with Jean-Eric Vergne in an incident wherein Pastor didn't leave much room and was lucky to avoid sanction for his part in it. 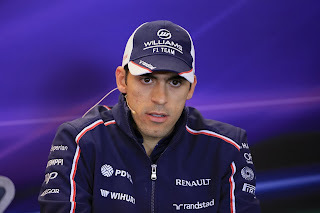 Pastor Maldonado - much maligned? But I for one wonder if Pastor, yes even Pastor, should be cut some slack on much of this. Some delving may make many of these matters not as straightfoward as appears the case on the surface. Picking a fight with Williams is in the eyes of many F1 opinion formers rather akin to picking a fight with Paddington Bear. And Pastor more than most was on a hiding to nothing on that one. But perhaps both of his 'crimes' against his employer can be thought of a little differently when viewed from another perspective. On the forcible extraction of himself from Williams, as Peter Windsor noted it's probable that Maldonado's considerable financial backers would have been reluctant to sign a cheque for year number four at the same team, particularly one that had rather stagnated over that period. A move therefore was to a large extent necessary for him to retain his USP. As for the suggestion that his car had been sabotaged, yes it is irrefutably wrong to make such a claim without full possession of the facts, but equally it is worth seeking to view this from Pastor's point of view, at least for some mitigation. In a season wherein there's been very little to choose between him and team mate Valtteri Bottas (those who have been saying - based on Austin only so far as I can tell - that Bottas has whipped him are plain wrong) he suddenly in Austin's qualifying found himself ditched in Q1 in 18th place in a session wherein the guy at the other side of the garage, sensationally, topped the times. With this we can forgive Pastor's bewilderment. And minutes after the session was over he had several microphones and tape recorders thrust in his face, and it was then - adrenaline still pumping - that he said what he said. He's since back-tracked, yet most seem determined to nurse their wrath on this one. But who hasn't made silly accusations when in the heat of the moment in an extreme situation? I know I have. So, more broadly what lays next for Pastor? It's well-documented that he has a great turn of speed, both on a qualifying lap and in races (he even sailed past Bottas in the Interlagos race, a fact that seemed to elude many), and that he's a Grand Prix winner and a GP2 champion cannot be taken away from him despite some observers' determined efforts. But his flipside is at least equally as oft-noted: that getting to the end of a race without a scrape is often beyond him. And perhaps most damningly of all over his three seasons in F1 it can't be said with conviction that he's shown sustained evidence of cleaning up his act. His Brazilian Grand Prix was just the latest demonstration that the quick drives still too often are spoiled before they're over. Could it be that his financial backing is a double-edged sword to an extent, in that the security it offers means there's less onus on him to refine his driving? It's possible. The ball's in Maldonado's court now. For as long as he brings the backing that he does he'll likely get opportunities, so he has time. He could become another Romain Grosjean: a driver who successfully makes the transition from fast but wild to fast but fast. Or he could become another Andrea de Cesaris: someone who even after 200 Grands Prix didn't seem to know how not to start accidents. Over to you, Pastor. He's one of those guys that seems to rub people up the wrong way. Taking the frequent contact alone (I've never forgotten that scrape in Spa with Lewis Hamilton) I think at the very least he needs to calm down a lot..
Williams have hardly helped themselves the last few years. It seems only now are they looking like they're getting a bit of hunger, but obviously it's all too late for Pasta.